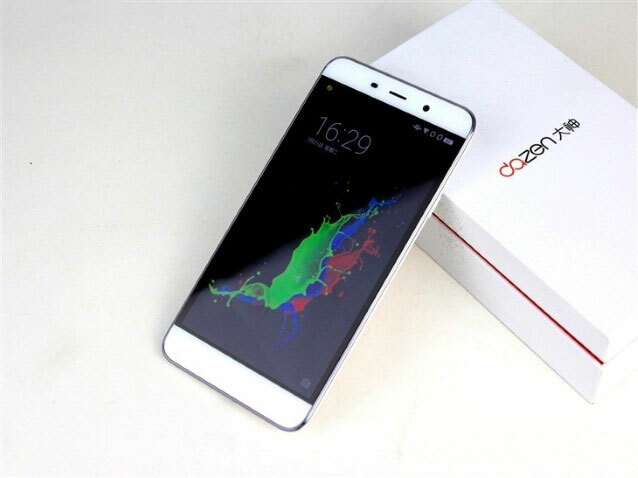 Chinese company Coolpad’s debut mobile in the Indian native the Dazen 1 was obviously an amazing phone, given the point that it was priced at Rs.6,999. At its selling price, the Dazen 1 offered very good value for money. 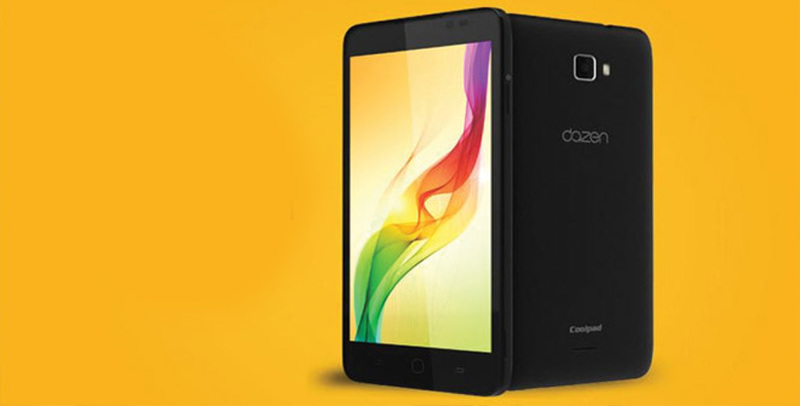 5 months later, Coolpad has introduced the Dazen Note 3, and listed it at Rs.8,999. The Dazen Note 3 is the least expensive — under Rs.10,000 — phone to come along with a finger-print sensor, which usually works and works quite nicely for sure. Perhaps surprisingly, that isn’t the sole interesting bit regarding the Dazen Note 3. There is much more, and when you take everything into viewpoint, the Dazen Note 3 definitely seems to be an amazing steal, mainly at its selling price. 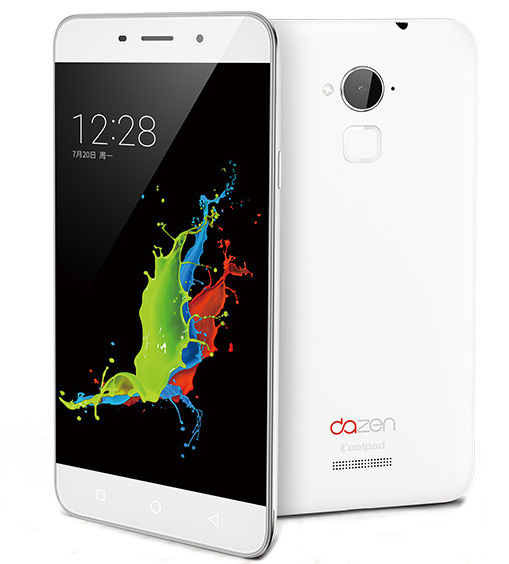 The Dazen Note 3 basically follows in the footsteps of the Dazen 1, which is nice. We enjoyed the Dazen 1’s simple, yet very ergonomic, design, and the Dazen Note 3 is no different. It is manufactured from plastic material, and that is fine thinking about its price. The plastic back is detachable and carries a soft matte texture which feels good in the hands as also improves grip. The back carries a comparable feel and look to it similar to the Dazen 1 and the Xiaomi Redmi 2. The edges are outfitted by an aluminium casing that breaks monotony of the design and ups the phone’s premium quotient. At 155 grams, the Dazen Note 3 is as heavy (or light depending on your point of view) as the Lenovo K3 Note. It’s not as thin though. Actually, at 9.3 mm its thickness is quite prominent. Nevertheless, it never gets beyond control. It is made possible by 2 things: good screen to body ratio and the gradual curve (of the back) towards the sides. 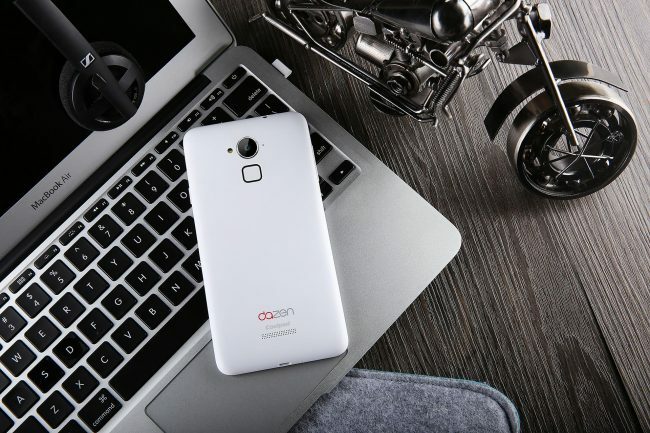 The two things help enhance ergonomics making one-handed operability on the Dazen Note 3 quite achievable. For a 5.5-inch phone at this price, Coolpad has done a good job as far as design and dimensional parameters are concerned. The right of the phone houses the power key while the volume rocker is on the left hand side. Their placement is not much of a problem and these offer good feedback. Coolpad provides you with physical capacitive keys for home, back and recent apps, but they are not backlit. The USP of the Dazen Note 3 is its finger-print scanner, which is on the backside, similar to how it is on the new Nexus phones, and an odd couple of gadgets such as the Huawei Honor 7. It gives you a possibility to save up to 5 finger prints. And boy, it’s fast. All it requires is a soft tap of the finger and boom the phone gets unlocked in a matter of moments. You can even use it to selectively lock applications which you want to keep private. The finger-print scanner is the headlining aspect of the Dazen Note 3, and yes it is not going to disappoint. The dualSIM slots and the microSD slot are attached underneath the removable back cover. The phone does not have any kind of protective covering on the display. The Dazen Note 3 has a 5.5-inch HD IPS display having a 720×1280 pixels resolution and 267 ppi pixel density that is certainly kind of a downer, since rival phones such as the Lenovo K3 Note and YU Yureka Plus offer you FullHD screens at around comparable price points. The Dazen Note 3 on the other hand wants you to deal with an HD screen. Provided that you keep your expectations low, it works nicely. Actually, the phone provides excellent viewing angles for an HD screen which is great. And it gets vibrant, lower than the K3 Note or even the YU Yureka Plus though. The Dazen 1 got really bright too. For what it’s worth that one had a smaller screen, with same resolution so that’s kind of expected. Even though the phone has great viewing angles, colours are somewhat off balance and also have an odd warm tinge. It comes with an option to manually control colour saturation. Switching it to vivid mode provides marginally greater results. The phone maintains manageable levels of brightness and viewing angles outside unless of course sunlight is directly reflecting at the screen. We have undoubtedly seen better displays in this price range. The Note 3 runs Android 5.1 Lollipop out-of-the-box together with the company’s custom made Cool UI on the top. Cool UI — like the majority of Chinese UIs — resorts to heavy customization which may or may not work in its favour according to users’ preference. It is made keeping simplicity of use in the mind though. The Note 3 wants you to get rid of multiple home screens, and as a result offers you most of the things (you need) on just one. You may still find multiple home screens — with no app drawer — however the drop down notification panel and Coolpad’s version of floating apps/widgets means everything is right there on one home screen. All this is managed properly without much mayhem. Let’s get started with the drop down notification panel. This one’s closer to Lenovo’s Vibe UI, while offering as many as 16 quick setting toggles, in one go. You cannot modify them or change their position though. Of the 16 quick setting toggles, the multitasking switch and C-button are worthy of a mention. The multitasking switch basically creates a floating menu that houses your basic apps (you can even add as many as you want to the list) and then enables you to pick 2 apps that you can then run simultaneously in split screen mode. Of course, they copied it from Samsung and it does not work as flawlessly though, but you know it’s there. The C-button creates a toggle wheel which gives you direct access to system control apps such as power, volume and screen brightness, which is useful. The app switcher is closer to the Lollipop approach but additionally provides you with the option to lock apps. The Note 3 is driven by a 1.3GHz octa-core MediaTek MT6753 processor along with Mali-T720. This is the first phone at its price to come having 3GB of RAM. On paper, the phone definitely seems to be perfectly endowed for the price. And, it’s an equally good performer in real usage. It’s cunning, peppy and incredibly responsive. Despite the fact that Coolpad has literally gone out of its way and packed the phone to its brim with unnecessary apps, the same does not affect performance. In fact, barring some periodic hiccups — especially while streaming 1080p content — the phone showed no signs of lag or unrest, even if we had multiple apps to the tune of 10 or more opened simultaneously. The phone was able to manage almost everything that we threw at it, without much pain. Performance was in line with phones such as the YU Yureka Plus. The phone has an advantage over the K3 Note, in overall performance and multitasking. While basic games are handled well, the phone has some difficulties while dealing with graphical games like Asphalt 8: Airborne at maxed out settings, with frame rate drips quite evident. These games produced much better frame rates at medium and low settings. All this while, the Note 3 was able to keep a cool head. It did get warm (on long usage) but nothing alarming. The Note 3 is sold with 16GB of built-in memory of which only 11.10GB is available for use. It supports expandable storage by up to 64GB via microSD card. The Note 3 comes with a 13-megapixel camera on the back with autofocus and LED flash. There’s also a 5-megapixel camera on the front. The camera app seems like it has borrowed a little something from everybody in the trade. At the same time, there is also an option to quick launch the camera by double clicking the volume down button. It’s not exactly very ‘quick’ though. Nonetheless it helps bypass the fingerprint unlock so that is saving a few crucial milliseconds. A word about the rear camera’s autofocus and shutter speed: they are awesome. Then again, the same cannot be said about the photos you click with it. What you get is average at the very best, and if you know any better the under Rs.10,000 segment has some good camera phones now. So that doesn’t help its case either. Image clicked in outdoor well-lit situations came out well with good amount of detail — dynamic range was good — and colours that were mostly true to source. Metering issues were few, so was noise or grain. Having said that, the rear snapper really struggles in tricky light situations, with noise being far too much in low light environments. Meanwhile, images shot in well-lit indoor situations pack in some detail although they are grainy. The camera app provides you with some neat tweaks in Pro mode — designed in classic Lumia style — which help control ISO and shutter speed. Auto HDR is missing so you will need to manually enable it. It does help a bit in tricky situations, but all in all, the camera performance is not the strong point of this phone. The Note 3 uses a 3,000mAh battery which happens to be larger than what the K3 Note and YU Yureka Plus offer you. Battery life therefore is fantastic. We put through the phone to 3 hours of 1080p video playback, 1 hour of music playback, around 30 minutes of graphics intensive gaming, phone calls to the tune of 1 hour over 4G and web browsing. We additionally clicked some photos with it. This gave us near to 11 hours of battery life on the device. The majority of users with more typical workload will be able to get close to one full day, without any hiccups. Coolpad’s Note 3 is certainly a fantastic value for money buy. It comes with a good display screen, provides good performance, comes with an amazing battery and features a fingerprint sensor that works like a charm. Now, you won’t exactly be able to make mobile payments using this feature as the phone lacks NFC, however mobile payments are still a rare breed in India, which means you won’t be losing out on much. There are disadvantages. 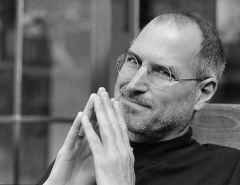 Many of them are related with the user interface. It is heavily customised and there are privacy issues. Then again it is possible to disable most of them (Cool Store and Xploree) from the settings. The Note 3 also offers a set of mediocre cameras – the YU Yureka Plus gives you better – that don’t necessarily dazzle. Additionally, the display is no match for the K3 Note. Although, when you go through the overall package, the Note 3 comes out as a better bet, and also a better value for money, with the additional bonus of a fingerprint scanner. The only ‘major’ thing bringing it down is the flash sale approach by which Coolpad is offering this phone. Beyond that we see absolutely no compelling reason why you should not buy the Note 3. When you go through the overall package, the Note 3 comes out as a better bet, and also a better value for money, with the additional bonus of a fingerprint scanner. The only 'major' thing bringing it down is the flash sale approach by which Coolpad is offering this phone. Beyond that we see absolutely no compelling reason why you should not buy the Note 3.